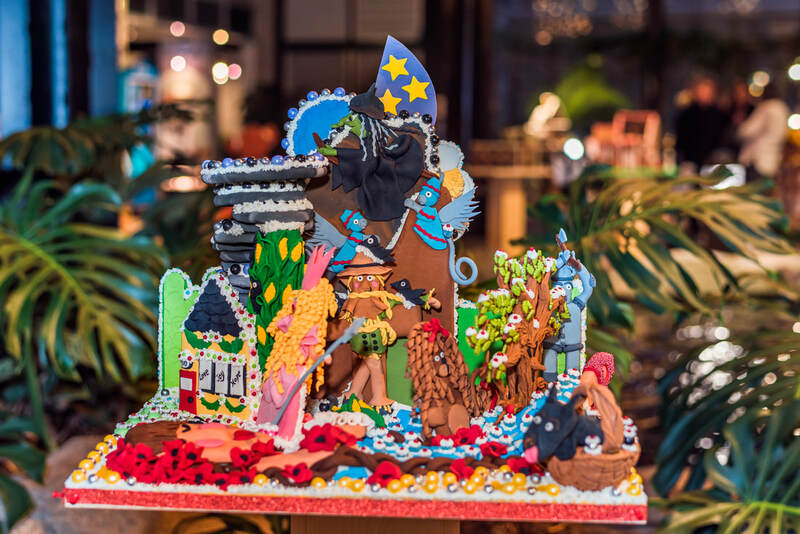 Vote for your favourite Gingerbread creation! How long did you take to make your creation? About a week? I started a few weeks earlier but didn’t get much done until the few days before it was due. I didn’t have a baking sheet big enough for what I wanted to do so some things had to be smaller and adjusted. I like the furniture especially the table and chair set. Did you use a unique ingredient or technique? My inspiration was the beautiful Victorian homes we are surrounded by in this city every day. I love history and admire the architecture created in the Victorian era. A Victorian home would be my forever home. Putting the house together to stand without breaking! All the little details put in to make it look ornate. For me, home is where my family is. Since I was a child, the physical space we lived in didn’t hold as much importance as the people we held dear. Representing this was my inspiration. Family has so many different meanings for people. Some family is blood related, and some are chosen. No matter how you define family, love truly makes the space a home. Sculpting the mother and child was the most challenging part! I’ve never worked with modelling chocolate before, and have also never sculpted a person. I am proud of the whole process. 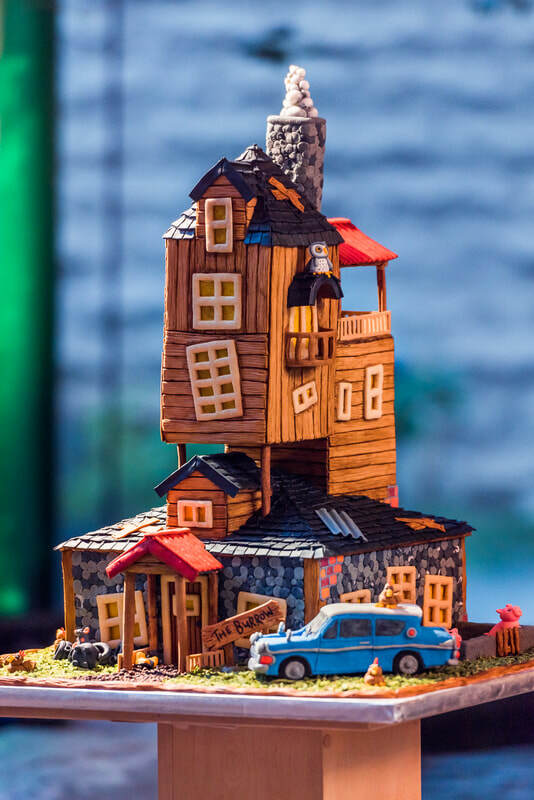 Seeing how it evolved throughout sculpting, seeing how the structure needed to change as each new challenge came up... the unique challenge of a 100% edible structure standing a minimum of 18 inches tall definitely is something to be proud of! I have always wanted to do the Wizard of Oz , but was not sure how to tie it in with the past few themes. So it was very fitting to come back this year to "There's No Place Like Home," after such a stormy time in my family's life. We get through life's storms with a good mindset, a big heart and lots of courage... and of course the wonderful friends we have met along the way! Four weeks of every spare moment I had -- 80+ hours! I would say a toss up of all the different hair and just how pretty and sweet Dorothy is. 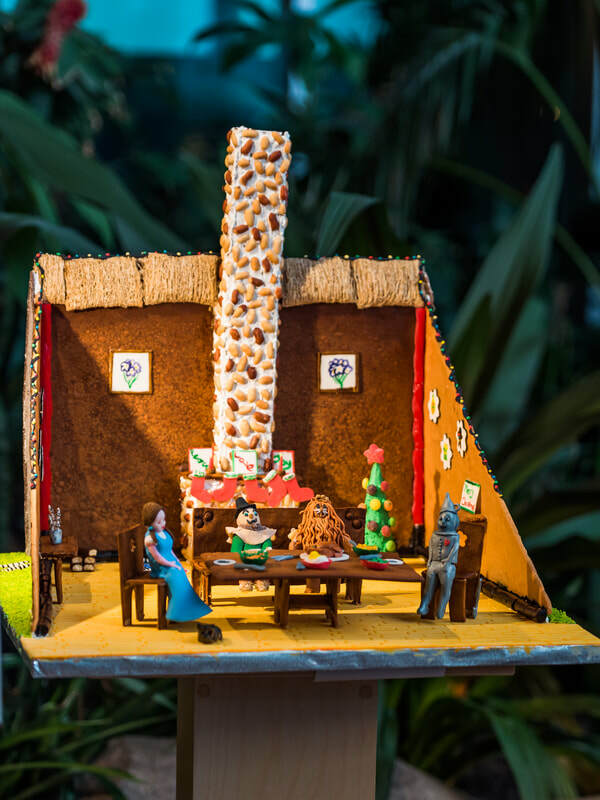 Participating in the Gingerbread Showcase. It took me about 100-120 hours. Focusing on a concept and working on the piece when the weather outside was good for gardening. My overall concept -- although I cobbled part of my shipping container house together with scraps . 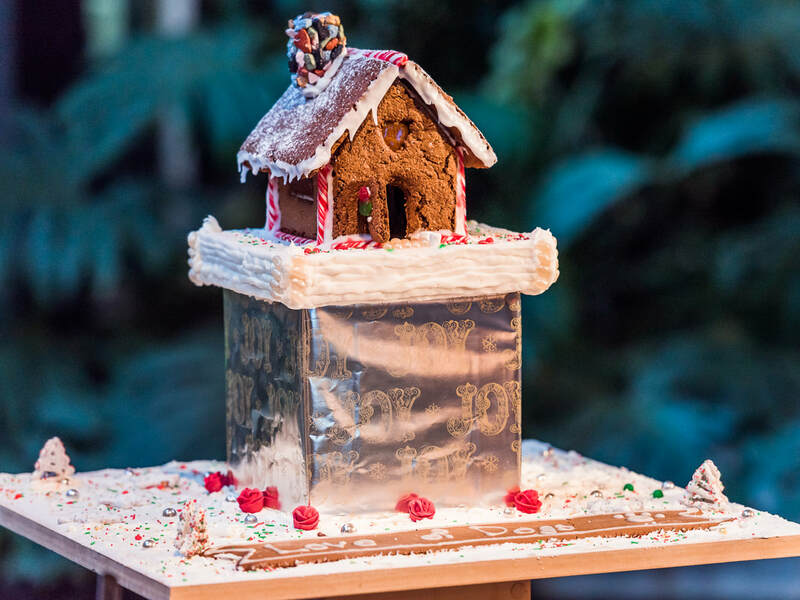 I built my structures from cut pieces of gingerbread after baking. Filled structures with popcorn to aid in its stability. No matter how great an adventure or where you travel, nothing compares to being home with your dog. 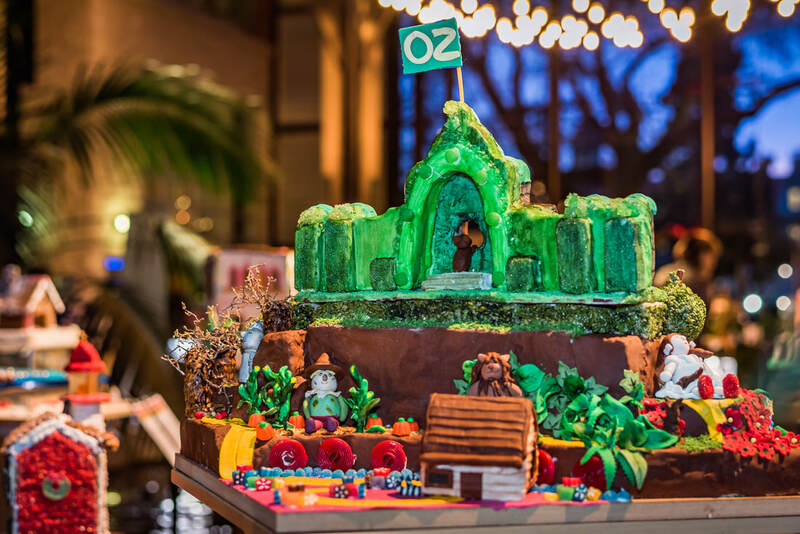 The theme is “There’s no place like home” which makes one think of the Wizard of Oz. Rather than create the piece solely in that theme we injected components of the movie in unexpected ways: the scarecrow using the loo, the lion hiding in a cave and the tin man’s head being created. Getting started. Meeting the 18-inch height requirement. The roof didn’t initially fit, so we had to be creative. The chimney on the log cabin. The fondant creatures. The glass windows. Unique ingredients: Montreal steak spice for the path, Pistachios for the chimney stones. Unique technique: Using a cordless drill to make a hole for the flagpole in the mountain. It took approximately 35 hours. The figures where very challenging. Trying to get the proportions right was difficult. The house came together nicely. 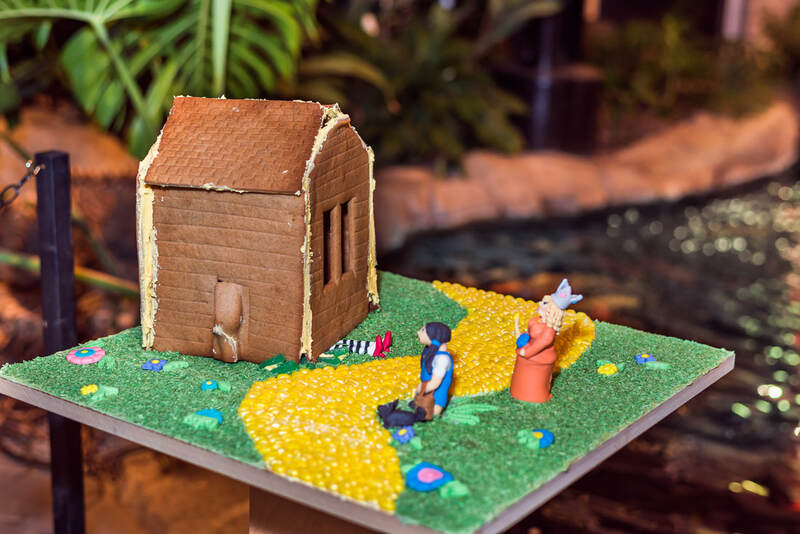 The grass is dyed coconut and the yellow brick road is made of jelly beans. 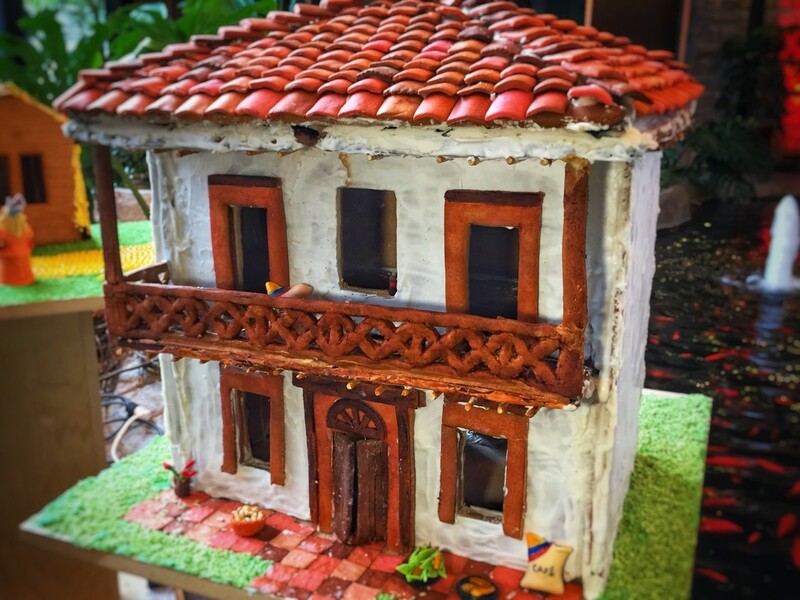 My mother is originally from Colombia, and when visiting I’ve always thought that the traditional houses found in the countryside incredibly charming. Determining how to support the roof and balcony rails - hopefully it all holds! Possibly the roof tiles? They are a little out of scale, but I like them. 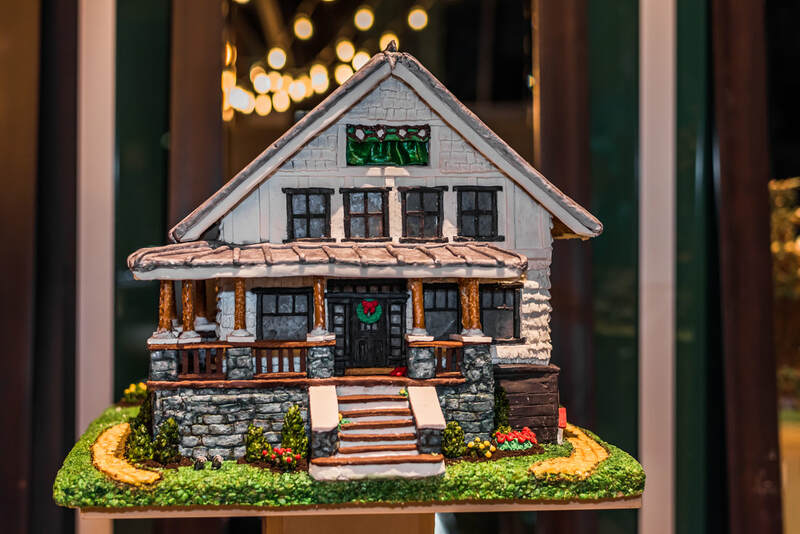 My inspiration was based on the idea of a small cabin or small house tucked away in nature. 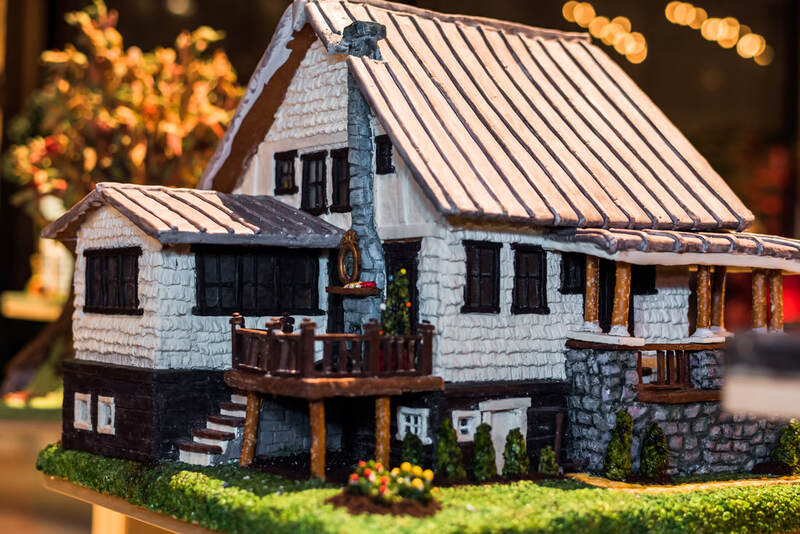 This is my first time making a gingerbread house and it was quite a process (making the dough, baking the pieces, buying the decoration, "gluing" the house together). I spent a number of hours each weekend. 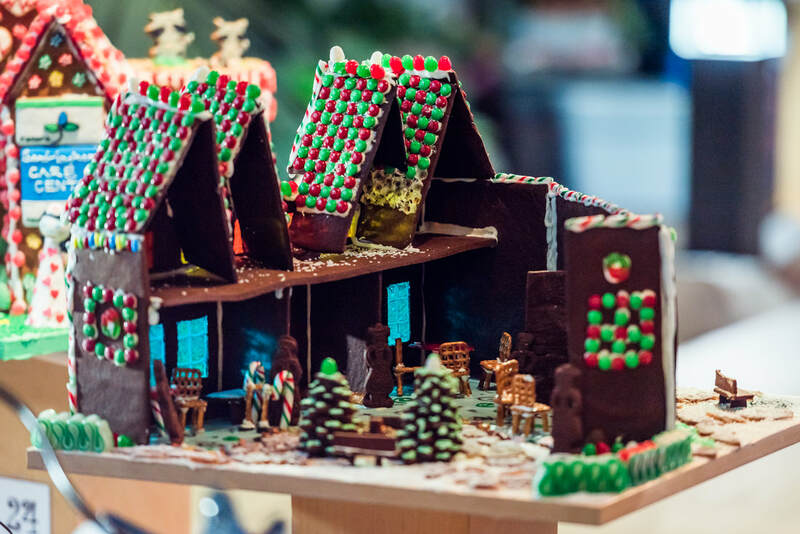 Coming up with an idea that was feasible and making the house from scratch (especially when I had no prior experience in making a gingerbread house). I am proud of the house and how it turned out. The house actually looks like a house. We thought of doing a twist on the Oz story where Dorothy ends up in Victoria. It's where we'd want to end up if we got stuck in Oz. We spent about 100 hours on the piece. Getting the two sides of the building to match up was the most difficult part of the project. The figurines were a big accomplishment for us, it was our first time sculpting. We used grape stems as branches in the Tin man's Forrest. ‘No place like Home’ led to ‘Dream Home’ to ‘ My home is your home’ or ‘Mi casa es su casa’ which led to ‘A man’s Home is his Castle’ which led to ‘Castles in Spain’ which finally became ‘Un palazzo a Venezia’ (which is not in Spain!). 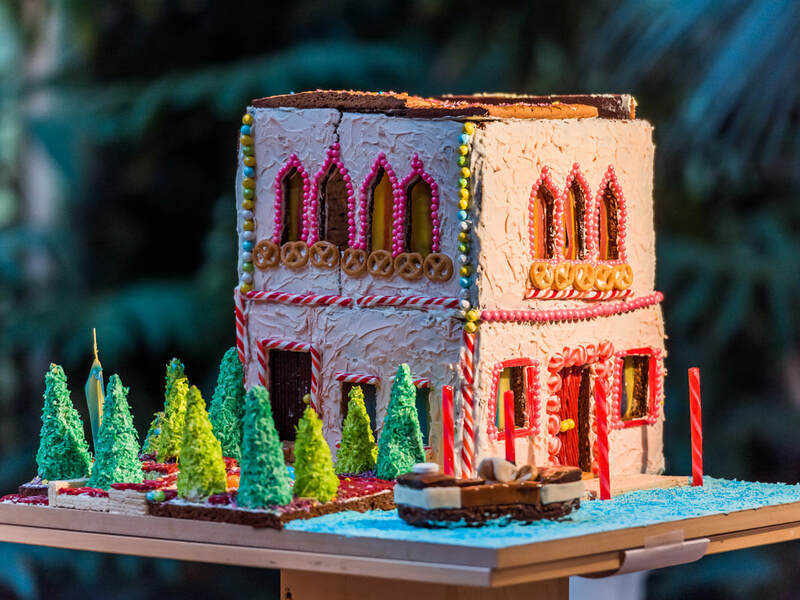 It was all a challenge since this was my first gingerbread project but in particular, trying to create large walls in one piece. I ended up cutting each wall into smaller sections and patching them together. The window panes are a combination of caramel rolled very thin and fruit roll ups. The Team Of Love Of Dogs and Cats wanted to help bring awareness that all animals deserve a chance to have a good home and care they deserve! We are proud of how it turned out! 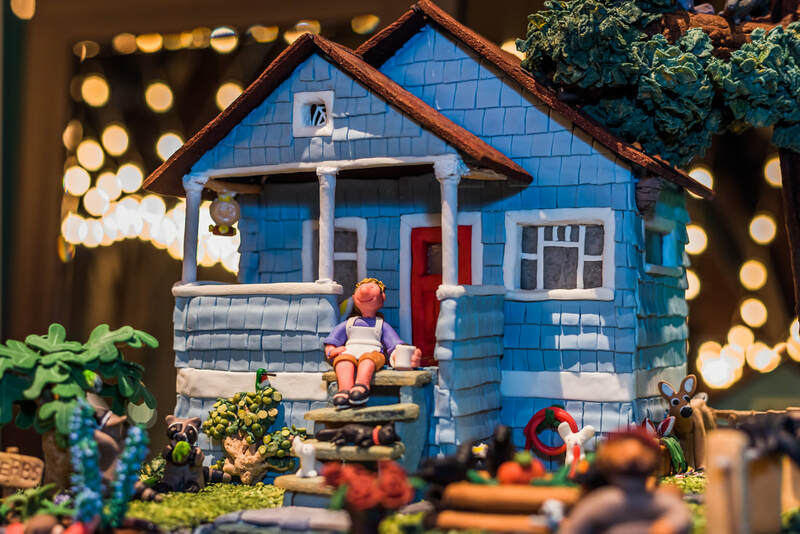 Assembling the gingerbread house on an “imaginary” island. 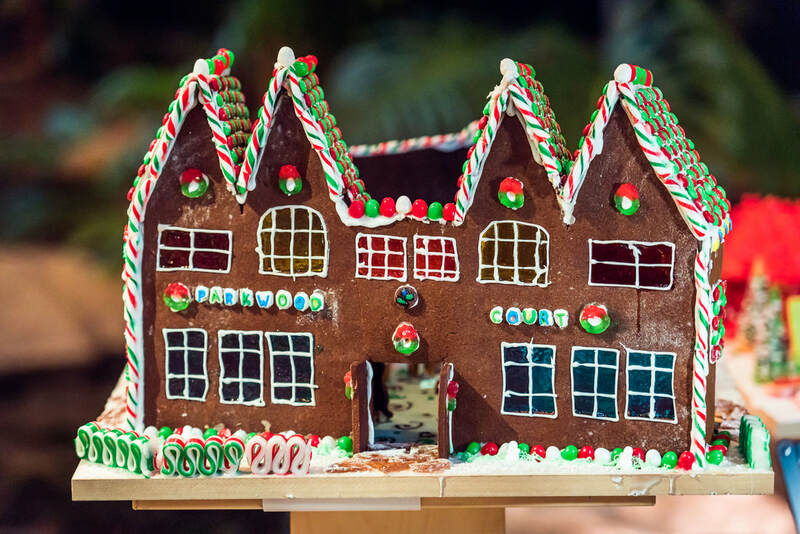 This is my first gingerbread house made from scratch. 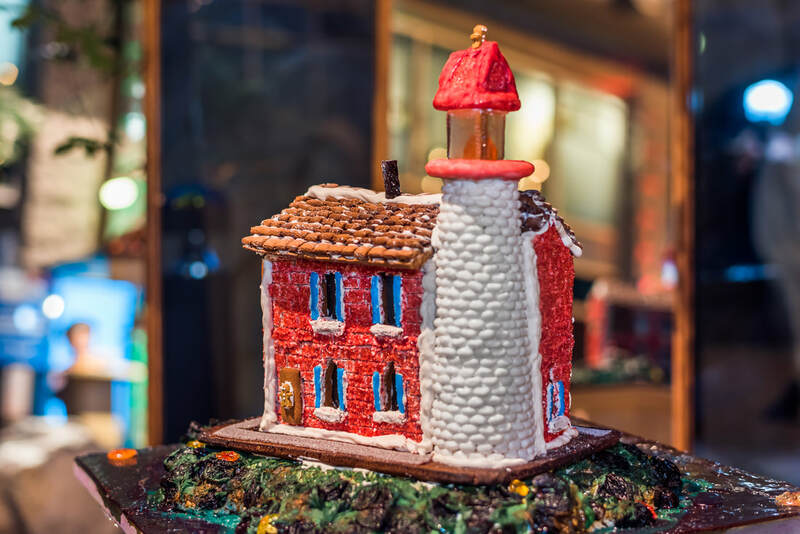 As staff of the Fisgard Lighthouse, we couldn't help but feel like it was the perfect representation of home. Each year we speak to visitors and one of the stories that has been shared with us is through the eyes of a Canadian seaman. He explained that each time their naval ship comes into the view of Fisgard Lighthouse, everyone on board knows they've reached their final stop -- they are home. Being beginners, we started this crazy project in the last week before we had to drop it off. 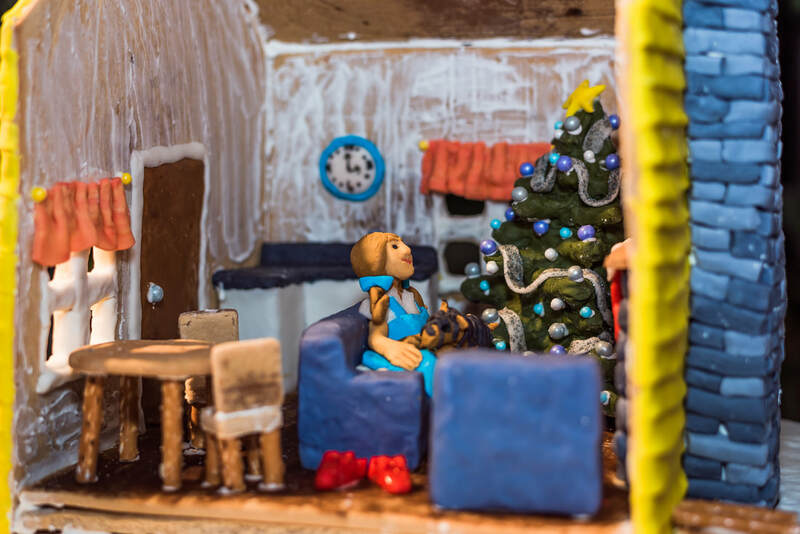 We 'hit our gingerbread game' hard after work every night until midnight. In total, it probably took us 30 hours. Everything was challenging! 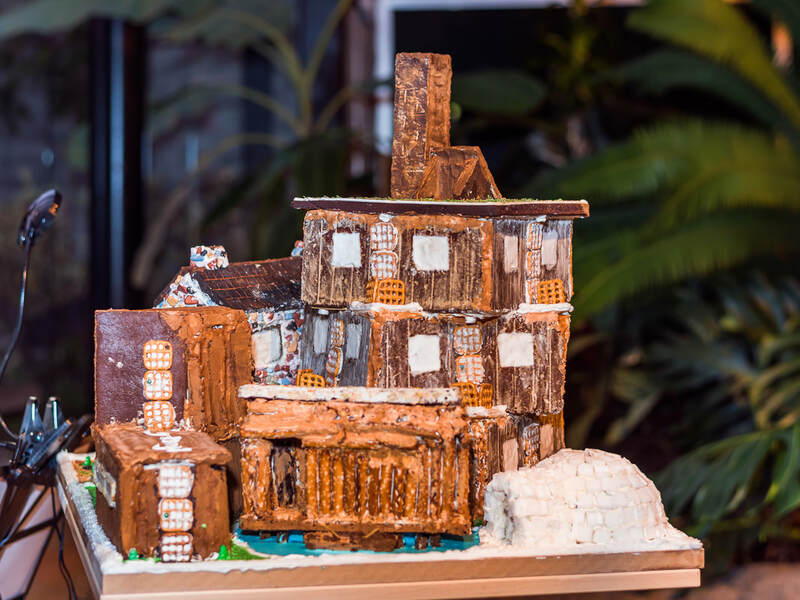 Especially realizing we weren't good enough bakers to accomplish our grandiose first plan! We are proud of ourselves for having a finished product -- and on time at that! 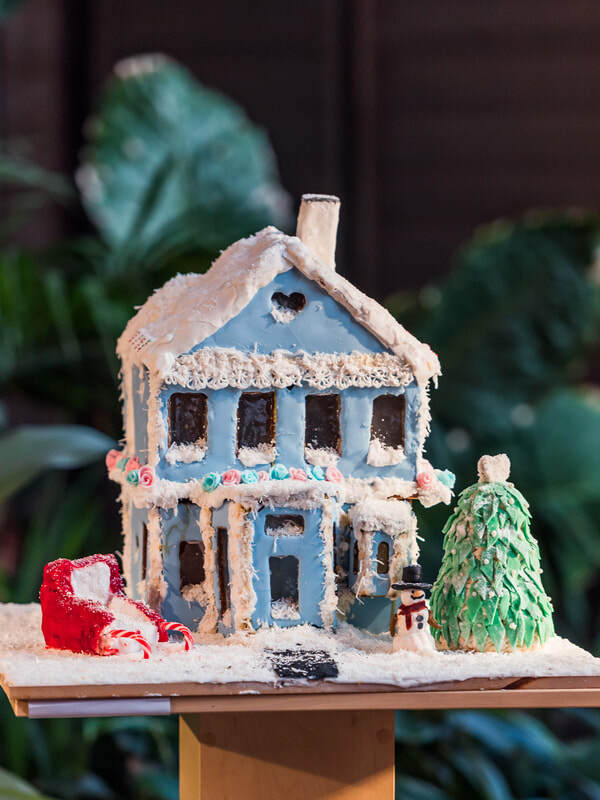 We had no idea what we were doing, but were inspired by last year’s entries and try it for ourselves. The light and the water are made of poured sugar. The rocks are made of prunes. My love of the Harry Potter Books. Although, Ron Weasley doesn't think his house is that special, I'm with Harry and think it is brilliant! What makes the home so special isn't necessarily the house itself, but the love inside. A home should feel warm, loving and accepting. It is truly a magical place not just for Harry, but to anyone who has been swept up into the Harry Potter world. Anyone and everyone is welcome, and is definitely a place I would love to call home. Not sure how many hours but I worked on it for about a month and a half. Not sure it was the most challenging, but the roof was the most time consuming. Cutting out all the shingles to the right angles. I tried shreddies at first but they kept breaking. The car and how the wood siding looks. I do also love scabbers! I toasted the coconut grass after colouring it to give it more colour variation. 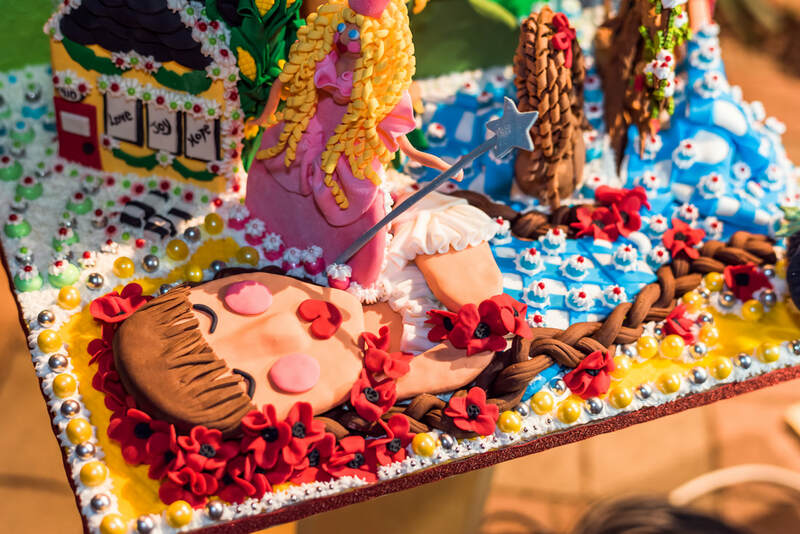 I spent well over one hundred hours on this creation, not counting the night time dreams and nightmares where everything was made of gingerbread and fondant. 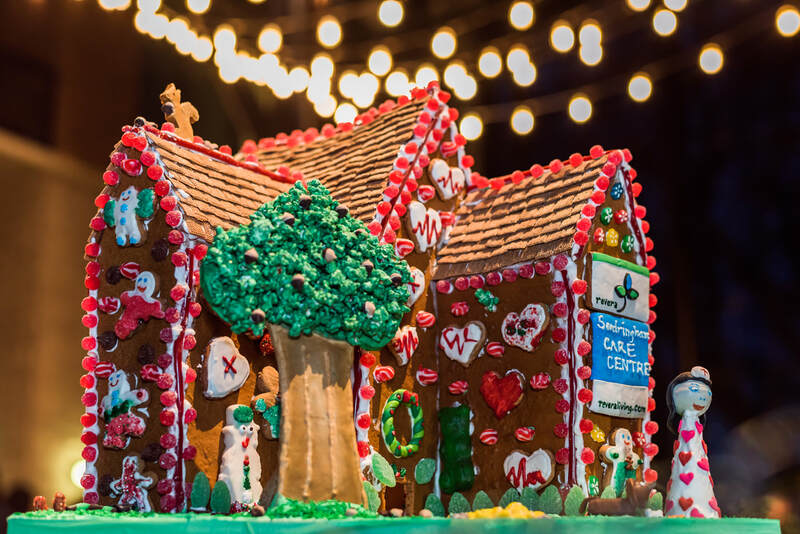 Building the big tree out of gingerbread was a real challenge, structurally and aesthetically. This is tree number seven. The first six trees lie in a pile resembling a small forestry operation. Maybe they’ll be the start of a log cabin project. Building the big tree out of gingerbread. I experimented with numerous combinations to create the perfect edible yet tough modelling clay. Several coloured batches were always on standby in the fridge. The winning combination was: 50 grams of candy melts/white chocolate wafers, 50 grams miniature marshmallows, 50 grams icing sugar. 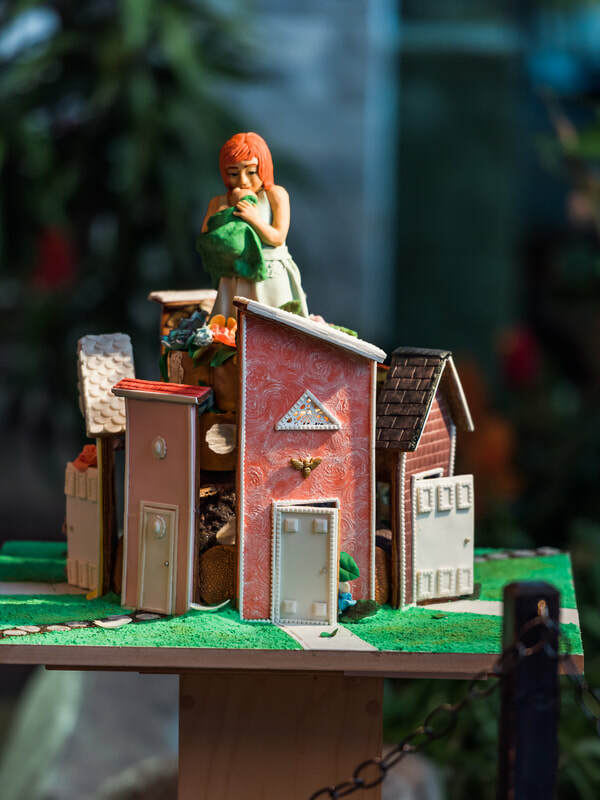 Taking inspiration from the Fred Penner song, “A House is a House for Me” and the book with the same title by Mary Ann Hoberman, we have tried to depict a variety of “homes” with their various occupants. It took us somewhere between 85 and 90 hours. Our creation stands about 65cm (26 in.). It houses 31 creatures of 14 species, and has 1554 leaves. The creatures we created: three bears, two squirrels, two cardinals, one owl, one eagle, one cat, four bunnies, four ducks, one turtle, five foxes, one beaver, four salmon, one frog, and Jenny. 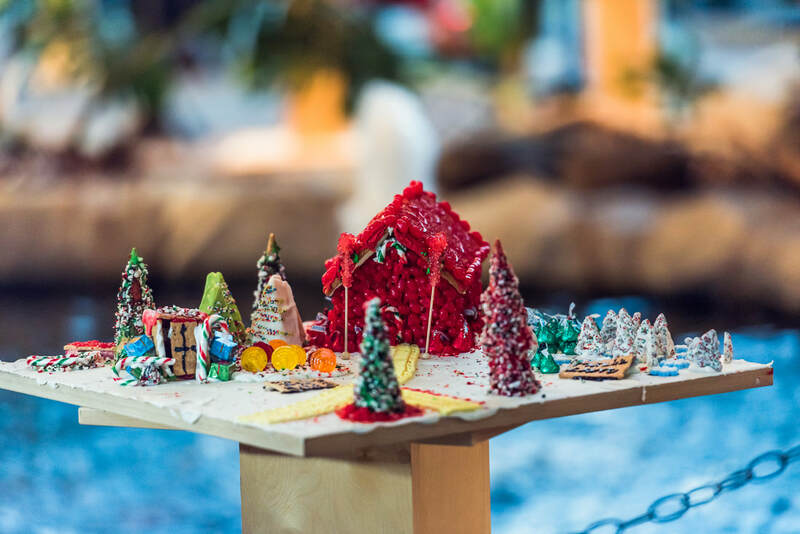 We used seven quadruple batches of gingerbread dough (including green, red, and yellow gingerbread), approximately six pounds of fondant, and half a pound of sugar glass (isomalt sugar). This was the first time that we have worked with isomalt sugar which we used to make the pond surface and the streams. Earlier this year, we lost our home to a devastating fire, so this year’s made us think of our home and how lucky we are to be able to rebuild. To make it fun, we thought we'd add a little magical twist of “Oz” by having Dorothy, and the rest of the crew, be the dwellers of our new home. To make this idea come to life, we added hints of each character and placed them throughout. Do you see them? 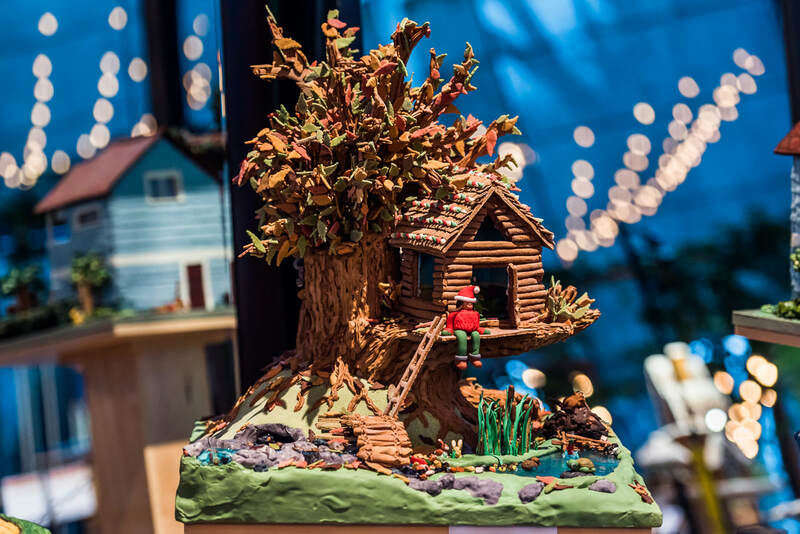 Find Dorothy's Ruby Red Slippers, The Tin Man's Axe and Oil Can, Scarecrow's Corn Row, The Lion's Medal of Courage, A Place for Toto, and more! Many hours went into its creation. Deciding what to do was challenging. Then deciding to recreate our home seemed a bit crazy. But with a little help and lots of encouragement, in the end, there is no place like our home. My family and I are proud of the way it turned out. It was nice to see our house come to life again. 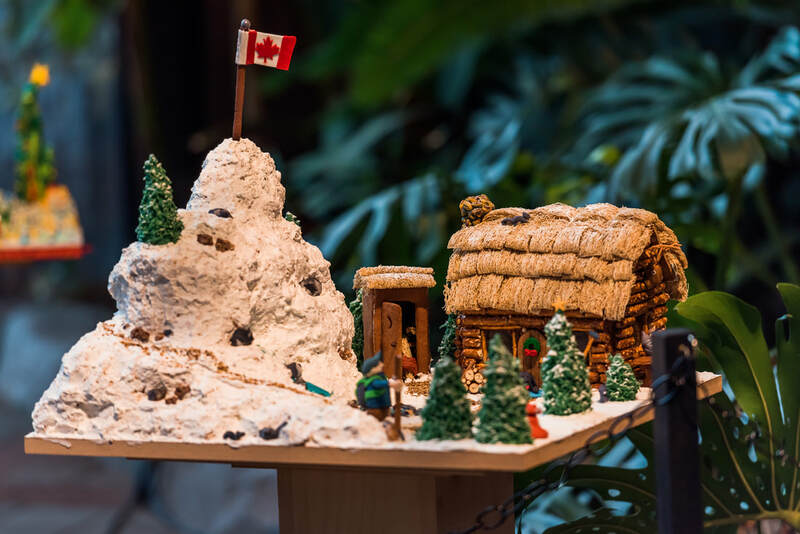 My inspiration was Vancouver Island and I was excited to capture the coastal rocks, crashing ocean and sea creatures in gingerbread and sugar. We worked on this piece slowly over a period of a month, with more and more long hours and sleepless nights as the deadline approached. Everything was a challenge! But I would say one of the biggest obstacles was overcoming the roof. I’m so proud of our perseverance. This project was bigger and more involved than any of us fully realized. We practiced until we figured things out. My husband jumped in and did all the sugar work. 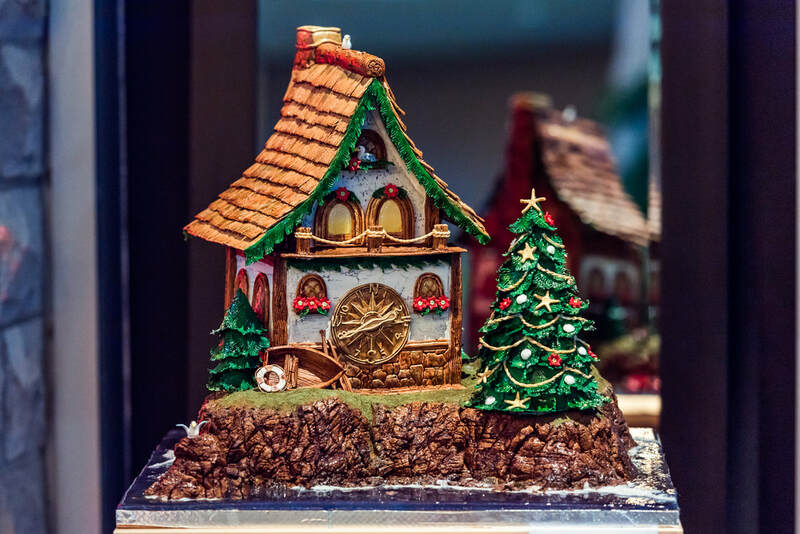 My father mixed colours and kneaded over 5 kilos of gingerbread pastillage, and they were both a huge moral support -- we made such a great team! 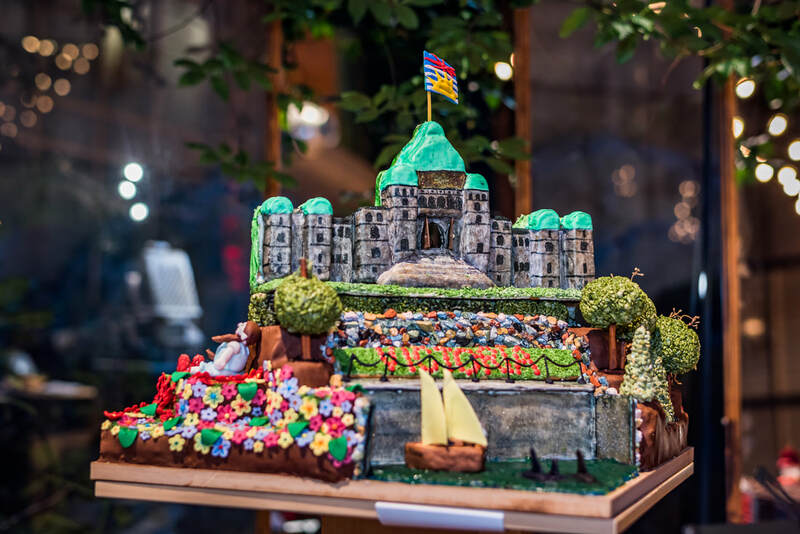 The rocky coastline was Gingerbread pastillage - sculpted, carved, baked, then formed back. 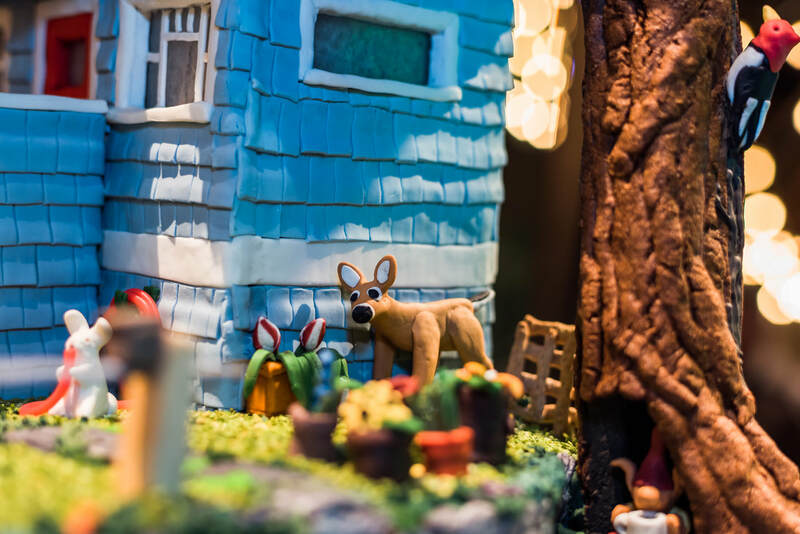 The beams and wood detail are gingerbread clay; the rock detail on the house and chimney was molded using gingerbread clay; the windows are all gingerbread clay piped through an extruder and formed by hand, then filled in with poured sugar for the window panes; the rope details are extruded gumpaste; and finally the Christmas tree is made from gumpaste and uses sugar flower technique. 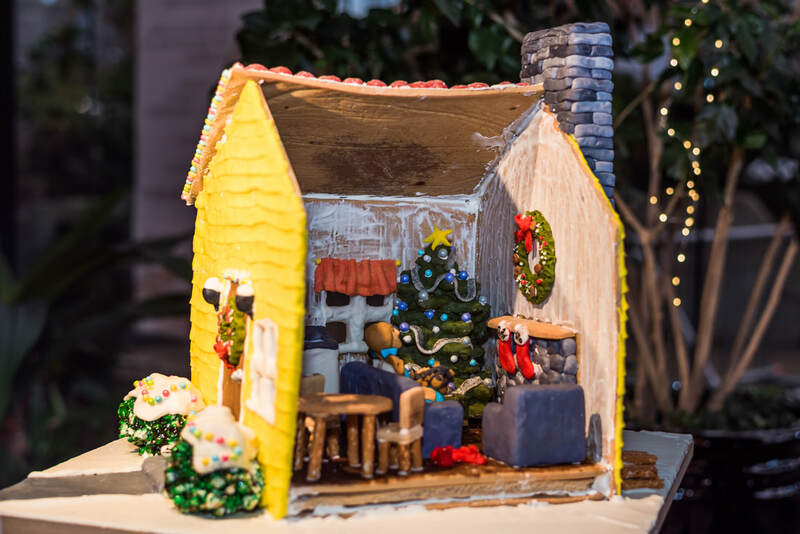 Our inspiration was to try and replicate our home that our residents live in but split the gingerbread house in half so you can take a peek of what goes on inside. This is a place that they currently call home and we would like to show it off. The most challenging part was the final decorating and all of the accessories in the home. I am most proud of how the team came together to generate ideas of what they would like to do for the submission. The final day of decorating we received a lot of support and was so much fun! No unique ingredient, other then candy galore. But technique was just being creative and how we can make furniture out of food. 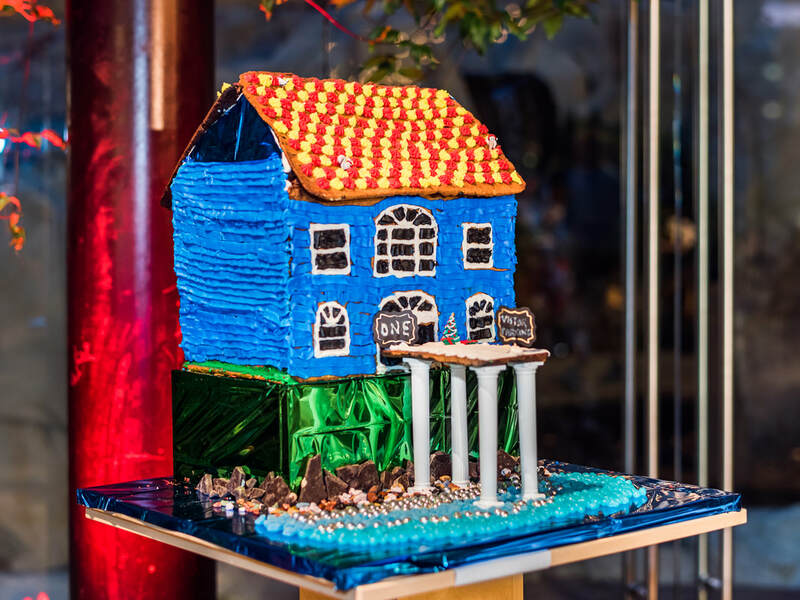 We wanted our gingerbread house to represent the therapeutic care and love that takes place in our home. 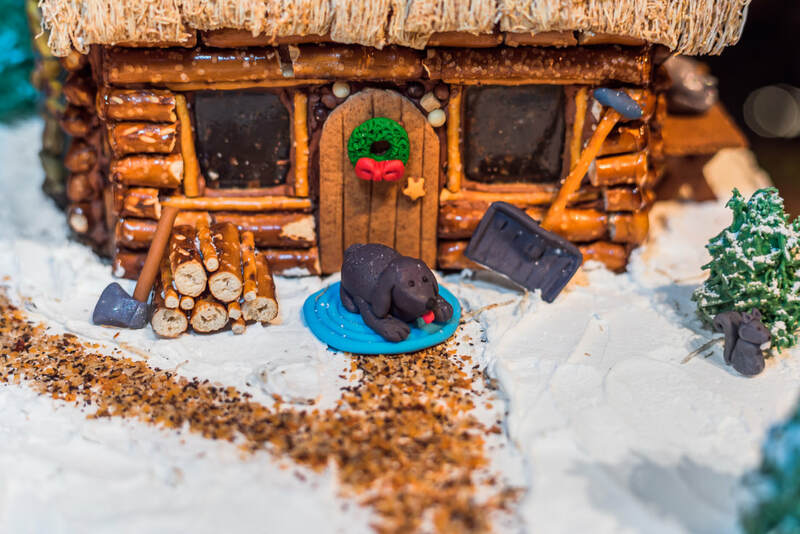 It was such an inclusive group/team effort building the gingerbread home…and that collaboration is exactly what happens at Sandringham Care Centre each and every day! We started the conversation and planning back at the end of September. We’ve been working on it ever since! 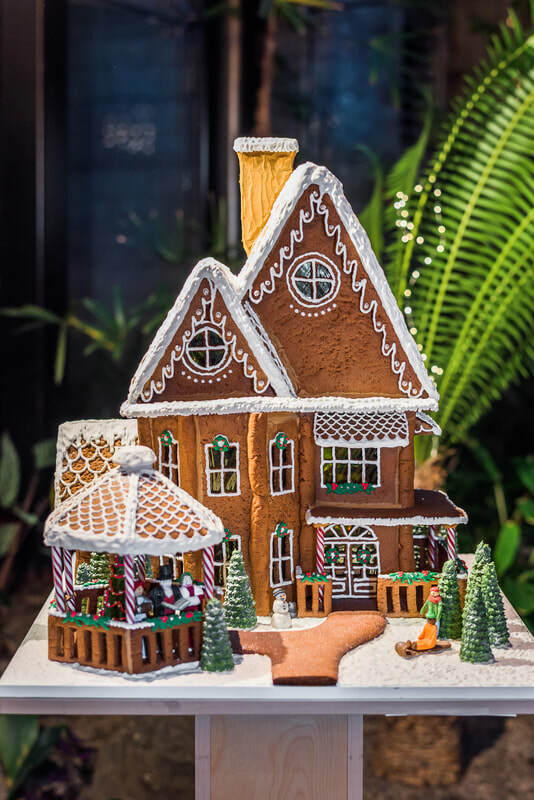 The amazing smell of gingerbread throughout our home…it was challenging not to eat all of the gingerbread and candy!!! 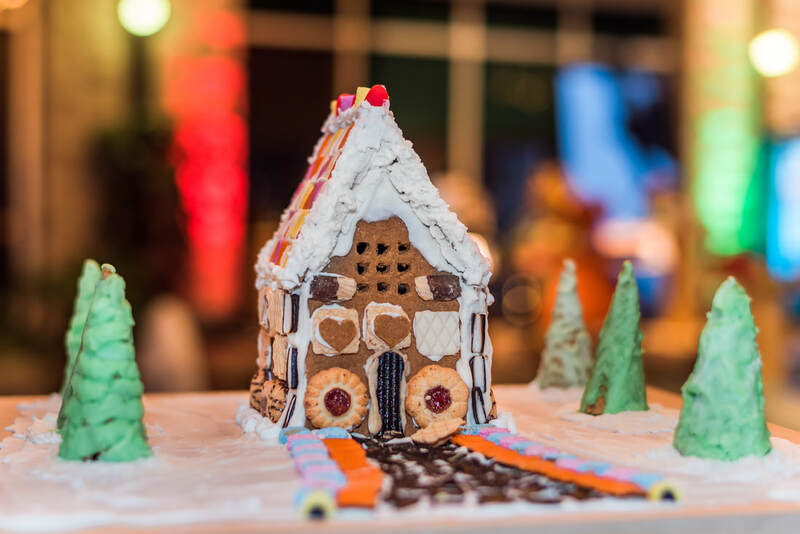 Definitely the team effort – culinary team members and residents with their baking, management with their creativity and support, staff, volunteers, and family members with their time and excitement to help build the house and be apart of something fun for a great cause. We all can’t wait to go and see it on display! 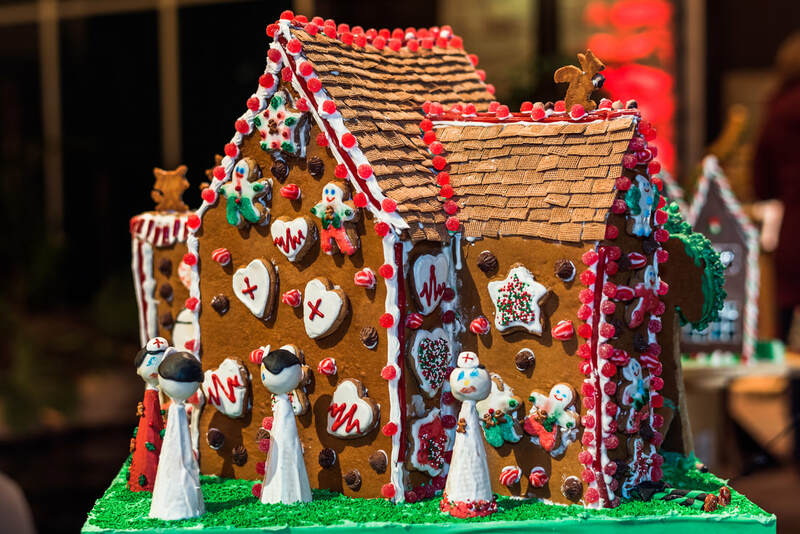 Just lots of gingerbread and royal icing, maybe a tootsie roll or two, popcorn, chocolate chips…and love of course! !